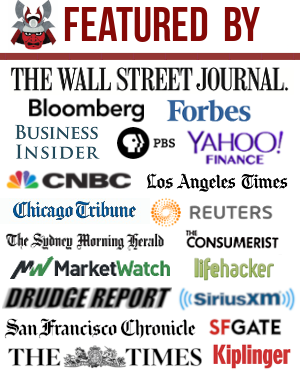 Wealthfront was launched in 2011 and is the original online financial advisor (robo-advisor) in the industry. Based in Silicon Valley, Wealthfront was the first to reach $1 billion in assets under management (AUM), and now has over $11 billion in assets under management as of 1H2019. I’ve personally met with some of their employees given I currently live in San Francisco. The reason why Wealthfront is so popular is because the first $5,000 under management that you invest is free with my promotional link, and they only charge 0.25% of your assets under management each year compared to 2% – 3% for traditional wealth advisors like Merrill Lynch and JP Morgan. Further, signing up to see their model portfolios is completely free. If you choose to have Wealthfront manage your money, you only need to start with $500. If you were to go elsewhere to get most of the services Wealthfront, such as Stock-Level-Tax-Loss Harvesting, Smart Beta, Risk Parity and Tailored Transfers, you’d likely have to hire a private wealth manager who requires million dollar minimums. Besides the much lower fees and lower entry point, Wealthfront is led by renowned economist Dr. Burston Malkiel, PhDs, and a data science team. They offer personalized and globally-diversified investment portfolios of index funds that are based off of Modern Portfolio Theory, designed to adjust according to your personal risk tolerance while staying diversified and tax-efficient. Description: Wealthfront is the only robo advisor who offers and all-in-one financial solution that includes free financial planning, automated investment management, and short-term cash management, with over $11 billion in assets under management. Founded: Wealthfront launched its service in 2011. Wealthfront is the only robo advisor who offers an all-in-one financial solution that includes three unique services fully automated in software: free financial planning, automated investment management and short-term cash management. Clients receive a personalized, globally-diversified investment portfolio that is managed for them when they open an account. Wealthfront provides data-driven, actionable recommendations to improve net-of-fee, after-tax, risk-adjusted returns. With an annual advisory fee of 0.25%, users can monitor their real-time investment performance, review recent transactions, receive financial advice, and manage their deposits. 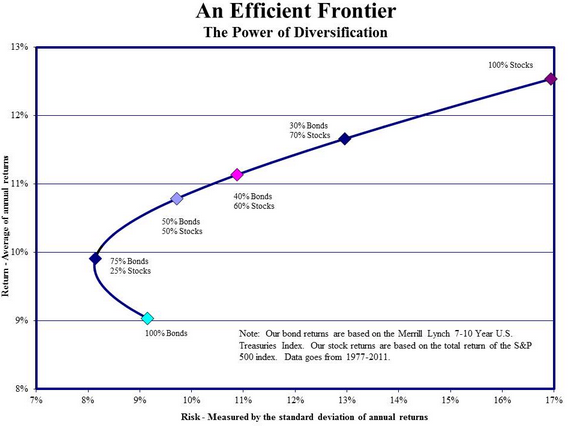 The efficient frontier is a concept in modern portfolio theory introduced by Harry Markowitz and others in 1952. If there are two portfolios that offer the same expected return, investors will prefer the less risky one. If the price is the same, wouldn’t you buy the exact same house with panoramic ocean views over the one with a view of another building? Of course you would. In Modern Portfolio Theory, everything is RATIONAL, which is why I’m such a big fan. Everybody here wants to improve their personal finances, which is why none of you are on Buzzfeed killing brain cells. Nobody here thinks they’ll have guaranteed employment for life, which is why you are building as many income streams as possible. Unfortunately, there are a lot of irrational people out there who believe they can get ahead without putting in the effort. I’ve even met some C students who think they deserve A lifestyles. No wonder credit cards are such big business. They allow consumers to realize their delusions. According to the Efficient Frontier chart below, optimum portfolios track the hyperbola. Portfolio mixes under the hyperbola are inferior because they either offer the same return with more risk, or they offer less return for the same risk. Portfolios above the hyperbola don’t exist because unicorns don’t exist. The markets will arbitrage everything away. Now that you’ve got a basic idea of Modern Portfolio Theory, let’s look at some sample Wealthfront model portfolios based off some specific answers given during the sign up process. The sign up process only takes several minutes because it’s free, and there are only 5-10 multiple questions to answer to access your recommended model portfolio. Let’s say you’ve recently graduated college and are just starting to build your retirement nest egg. You contribute to your IRA or 401k at least up to the company match, but you also want to invest after-tax dollars efficiently to one day buy a car, a home, or go to graduate school. So you wisely sign up for Wealthfront for free to see what they have to offer. Based on your situation, Wealthfront may classify your risk tolerance as a 10. You’ve got nothing to lose, and only upside as you grow your earnings. With a risk tolerance of 10, notice how you have 95% of your asset allocation in stocks and only 5% in bonds. Historically, stocks have returned between 6%-8% a year versus bonds at only 3-4% a year. The older you get, usually, the more responsibilities you have. You may have a spouse or children who depend on you. You may also have a mortgage that needs paying off. The good thing about being older is that you generally are making more money and have more savings in the bank. Therefore, it’s probably prudent for you not to take as much risk as someone who has no dependents and a much smaller amount to invest. Below is a sample investment asset allocation for someone with a risk tolerance of 5. Roughly 70% of the portfolio is weighted in stocks, with the rest in bonds. During the latter part of your career and life, your investment portfolio should be at its largest point if you’ve been consistently saving and investing. Your number one priority is to protect your principal at all costs because your ability or desire to work won’t be as high as when you were younger. Therefore, it’s natural to have a lower risk tolerance. With a risk tolerance of two, Wealthfront will construct for you a portfolio consisting of 52% stocks and 48% bonds. You don’t necessarily have to be over the age of 50 to follow this asset allocation. As a 40-year-old early retiree, I’ve chosen a 50/50 stocks/bonds asset allocation because I’ve already accumulated “enough” money to comfortably live off my dividends forever. The great thing about Wealthfront’s investment portfolios is that you can can manually change your risk tolerance number to see how the model portfolio changes. A lot of people may think they are more risk tolerant than they really are. The more recessions you’ve been through, generally the lower your risk tolerance because you can see how devastating a correction can be to your wealth. In 2008-2010, I lost 35% of my net worth that took 10 years to build. I’ve now aggressively build up multiple income streams and a very diversified net worth in order to never experience that type of decline again. One of the keys to building long term wealth over time is to make your investment contributions consistent and automatic. Wealthfront has an easy feature where you simply link up your checking account and tell them to contribute X amount every week, two weeks, month, or quarter. Time in the market is much more important than timing the market. You want to have your returns compound month after month, year after year until you build a portfolio so large that small percentage gains can mean big returns. For example, I’ve currently got a roughly $2 million public investment portfolio. If I can just return 5% a year, I’ll earn $100,000. Not bad! Portfolio rebalancing keeps your allocations amongst stocks, bonds, and different sectors in balance over time. This is key to ensuring diversification. This feature is done with software automatically on a daily basis to continually buy some assets when they are low and sell others when they are high. No longer do you have to worry about constantly ensuring you have a properly balanced portfolio. Each year, you are allowed to take capital losses to reduce your taxable income in that year. The amount you can write off depends on your income level, but the number most often referred to is $3,000. Financial advisors usually review your portfolio near the end of the year and will sell some losers to help you meet this deduction. Wealthfront offers this feature to all clients at no added cost, as part of its PassivePlus investment suite including Tax-Loss Harvesting, Stock-Level Tax-Loss Harvesting, Risk Parity, and Smart Beta. 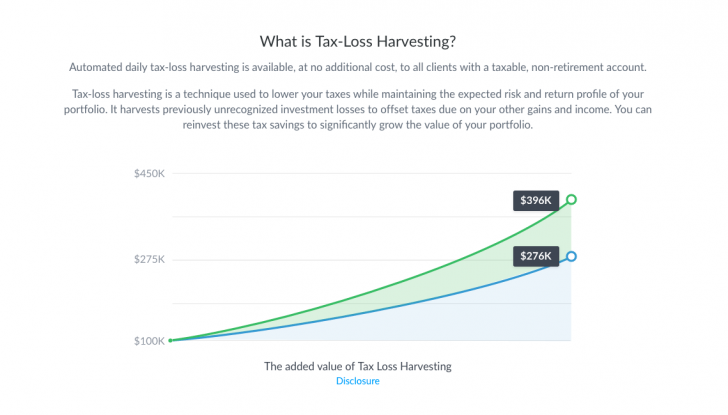 When it comes to optimizing earnings in taxable accounts, Wealthfront focuses on Stock-Level Tax-Loss Harvesting as a way to improve the results of tax-loss harvesting while also keeping fees at a minimum. Here’s how it works: Instead of using ETFs or Index Funds to invest in U.S. stocks, Stock-Level Tax-Loss Harvesting directly purchases up to 1,001 individual securities on your behalf. harvesting service, so you can see for yourself. Available for no extra cost to taxable accounts over $500,000, Smart Beta is an investment feature designed to increase your expected returns by weighting the securities in the US stock index of your portfolio more intelligently. Tailored Transfers are a key component of our Portfolio Review and a service that no other advisor — robo or human — offers. If you want to switch advisors or move your brokerage holdings into a diversified portfolio, you typically have to sell all your holdings and move in cash. This means you will more than likely have a large tax bill. Instead of selling your holdings, we will directly transfer them into a diversified portfolio tax efficiently, saving you that tax bill. Their 529 College Savings Plan is another investment account unique to Wealthfront. A 529 College Savings Plan allows investments to grow and compound tax free until the money is used for grade school tuition or university tuition. Being able to pay for grade school tuition with a 529 plan is new from the 2018 Tax Reform Plan. Wealthfront launched Wealthfront Cash Account in February 2019 as the next important step towards automating all of its client’s finances. Cash Account is a secure place to stow away cash you may plan to invest, spend within a few years or use in an emergency. The account offers an interest rate of 2.24% and is FDIC insurance for up to $1 million. That’s nearly 20 times the national average interest rate and four times the insurance you’d receive at a traditional bank. Wealthfront clients can open a cash account with as little as $1. The account isn’t subject to any market risk and offers unlimited and free transfers all for no fees. automatically enrolled in its Portfolio Line of Credit (PLOC) which establishes a line of credit that can be instantly accessed with no paperwork or credit check for an amount up to 30% of a client’s account value. In most cases clients can get their money in less than 24 hours. Wealthfront is able to keep its rates below most home equity lines of credit because the PLOC is secured by clients’ diversified investment portfolios. Interest is accrued until the loan is paid off and clients are able to pay back their PLOC on their own schedule. The company knows of no other consumer loan that is faster, easier or less expensive to access. Wealthfront launched a new free automated financial planning experience for all to better plan for their financial future in December 2018. Many clients don’t know what their financial goals should be, and even more don’t realize that the goals they’ve set with their current spending and saving patterns are actually unattainable. Wealthfront built something more personal, connected and instant than any financial advisor could ever be. Powered by its automated financial engine, Wealthfront takes advantage of their team of PhDs to analyze your past behavior from connecting to your financial accounts, showing you what’s possible for your future. As your financial advisor, it’s Wealthfront’s job to sometimes be the bad guy and tell you that you can’t necessarily afford the lifestyle you want. So Wealthfront designed Path to first assess your basic financial health, before we let you imagine what’s possible. They start with your needs before they get to your wants and wishes for one simple reason: If the foundation is shaky, then the rest is irrelevant. How much Social Security should I plan to take at retirement? Wealthfront can show you the impact of the full benefit, half-benefit and no benefit of Social Security on your future plan – and how much you should be saving right now. Can I take extended time off from work to travel? 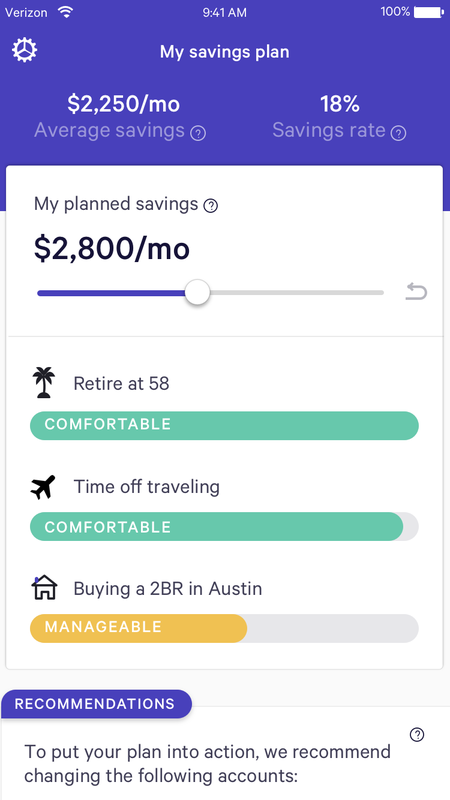 Wealthfront shows you how much time you can afford to take off from work, what it might cost to travel, and the impact it would have on your other goals like retirement. How much tuition should I plan to cover for my kids’ college? 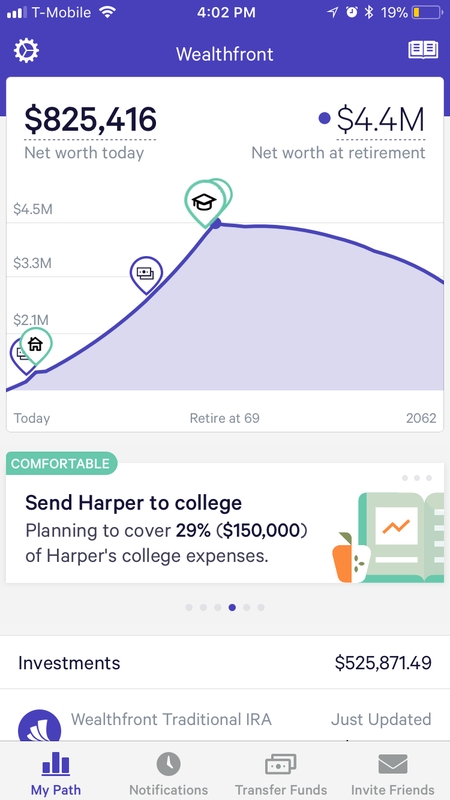 Wealthfront shows you the financial aid you can expect from any College or University in the U.S. so that it can tell you exactly how much you need to save to send your kids to college. After spending 13 years of my career working in the finance industry for large banks such as Goldman Sachs and Credit Suisse, it’s clear to me that Wealthfront is revolutionizing the way everyday people can get better wealth management services. Too many people are cashed up because they don’t know how to invest or where to start. Wealthfront has lowered the bar so that anybody with 5 minutes of initiative can get started. In the past, you’d have to come up with at least $1 million to have the privilege of paying a 2% – 3% fee each year ($20,000 – $30,000!) to have someone manage your money. Now, you can pay just 0.25% and start with just $500 with Wealthfront. Technology and the internet is a boon for consumers. I’ve researched and followed Wealthfront since the beginning and I highly recommend Wealthfront as a low-cost, after-tax retirement solution. You can sign up with my link to get the first five thousand managed for free. It’s worth signing up to at least see what their sophisticated algorithms will suggest as an ideal model portfolio. Once you have the data, you can build the portfolio yourself. About the Author: Sam began investing his own money ever since he opened an online brokerage account in 1995. Sam loved investing so much that he decided to make a career out of investing by spending the next 13 years after college working at Goldman Sachs and Credit Suisse, two of the leading investment banks in the world. During this time, Sam received his MBA from UC Berkeley with a focus on finance and real estate.